Usually as fighters grow older, especially after taking a few knockouts, they begin to change up their style. Things will get more conservative in the ring, more cerebral. It’s less about the visceral kill and more about adapting to survive in the ring. The thing is, Chuck Liddell didn’t want to be that guy because that isn’t what he found enjoyable about fighting. 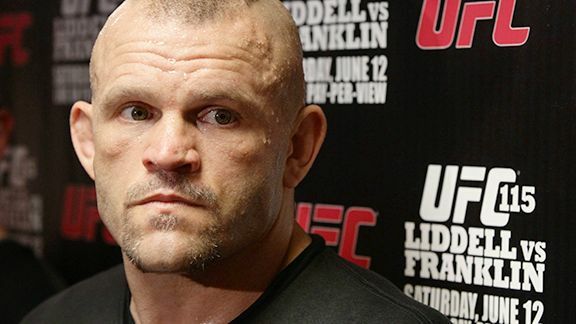 Chuck Liddell didn’t want to change who he was because it would mean a longer career, he already had a legendary career and is one of the greatest champions of all time. “Towards the end of his career I begged him not to so much and he still wouldn’t,” says Hackleman. “He would not stop bangin’. He banged ’till the end. He couldn’t help it. We would spend hours and hours and hours [on it]. We put the little thing down between his chin and his shoulders to keep his chin down. To keep his hands up, I’d put weights in his hands, stuff under his arms. Hours and hours and he would drill it, drill it, drill it. The second he hit someone and just saw that little spark in the eye, that killer instinct would take over and he’d drop his hands to his hips, put his chin up in the air and just start swinging for the knockout. He’d forget everything.